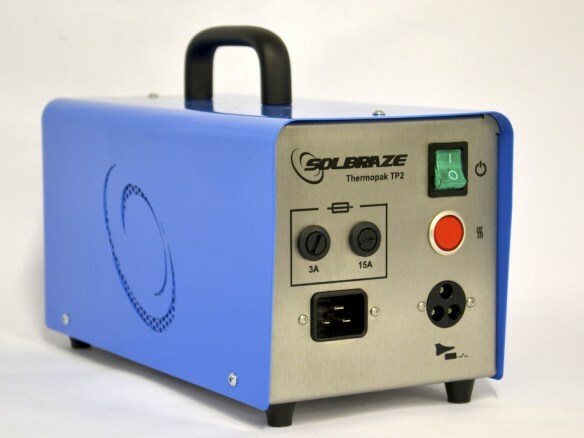 The Solbraze range of power supplies (Thermopaks), when used in conjunction with the Solbraze range of tongs (Thermotools) give you all the power and flexibility you need to complete your soldering or brazing job quickly, safely and effectively with added cost savings on energy and time efficiency. Solbraze Thermopaks and Thermotools are robust and built to last in even the most taxing of environments. The resistance soldering process is effective with both leaded and unleaded solders as well as silver soldering and brazing alloys. The principle of resistance heating is that heat will be produced as current, generated by the power supply, flows through a material, such as copper wire, until it meets a higher resistance material such as the carbon electrodes in the tongs. Heat is produced by this resistance and transferred from the electrodes into the component parts to be soldered, or brazed, that are held within the jaws of the Thermotool. Resistance soldering is suitable for soldering and brazing components of good electrical and thermal conduction properties such as copper, stainless steel, aluminum and other ferrous and non-ferrous materials. Direct resistance heating is used on relatively long sections of uniform cross section. This method is not usually used for soldering but can be used for annealing and stress relieving. Energy efficiency is excellent when compared to ordinary soldering as you apply heat only where and when it is required, saving on energy costs. Due to fast localized heating there is no heat or flame damage around the area to be soldered and this eliminates the need to protect adjacent windings, previously soldered joints, or other components that are nearby, from flame deflection and stray heat. Rapid heating means less thermal damage to surrounding insulation be it enamel, glass fibre or paper and therefore reduces the amount of reinsulating work. Heat distortion of components and materials are minimized. Resistance soldering provides a consistent heat throughout the whole bonding process which will mean a stronger joint and less dry joints. Equipment can be used in hard to get to areas and spaces. This can be especially useful for working with previously fitted equipment such as plumbing, refrigeration and air conditioning pipework. Safety benefits include the rapid cooling of tools and the reduction of fire hazards. Safe low voltage tools mean no electric shocks, even in damp conditions. The ability of the tool to clamp the copper bars, or other applications, during and after the soldering process removes the need for clips, wire binders or clamps. The electrodes can be easily shaped and notched to make a good connection with the application. There is no need to grip the application tightly as excessive pressure can reduce the rate of heating. The Solbraze range of Thermopaks and Thermotools are used throughout industry in many different applications. The flexibility of the Thermotool range means that industries as wide ranging as plumbing, electrical motor, cable and transformer manufacturers use resistance soldering products from Solbraze to complete projects on time and on budget. Thermopaks are the power supply units that supply the high current but low voltage to the Thermotool and they come in three standard power ratings. All Thermopaks come with selectable power settings to vary the power depending thermal properties of the components that are to be joined. The larger units also come with a process timer to aid repeatability and consistency of the soldered or brazed joint. Thermotools have a special grade of graphite ‘carbon’ electrode in each jaw so that when the Thermotool is clamped around, or held against, the application an electrical connection is formed and heat is formed and transferred to the materials being held. The 1 kVA TP2, when used with the smaller Thermotools, such as the R7615 and TT5, is ideal for smaller electrical connections as well as for plumbing and pipe refrigeration work. At 1.5 kVA the TP25 is perfect for mid- sized electrical work such as medium sized bus bars, stators and materials of a larger thermal mass and is suitable to work with the TT7 and R7107 Thermotools. The 3kVA TP3 has a separate water-cooler and a special water-cooled HD3W Thermotool that is ideal for heavy electrical connections and high production work. Solbraze can also produce other power ratings. Thermopaks such as the TP8 which has a 30 kVA rating has been used for cable brazing up to 95mm CSA cables. Please contact us and ask us about our range of Thermopaks and how they can help you. We also are able to accurately control the heat to the components and materials to be joined with our new programmable Temperature controlled TP2 with thyristor and thermocouple control which is ideal for ensuring the components are getting to the correct temperature for consistent soldering joints and that heat sensitive materials do not get damaged and distorted through unnecessary overheating. Download the Technical Information for our Resistance Products.